Post and photos updated and video added October 11, 2017. I’m all about a dense, chewy, fudgy cookie. And these cookies are soft and fluffy. I’m all about chocolate. And these are, well, not. And I totally wish I could deliver a batch of these to all of you personally so that you could understand just how good they are. But I can’t. You’re just going to have to make a batch for yourselves and thank me later. Yes, they’re soft and fluffy instead of dense and chewy like most of the cookies I make. But they’re filled with brown sugar. And they’re topped with brown sugar frosting. And pecans. Pee-cans. 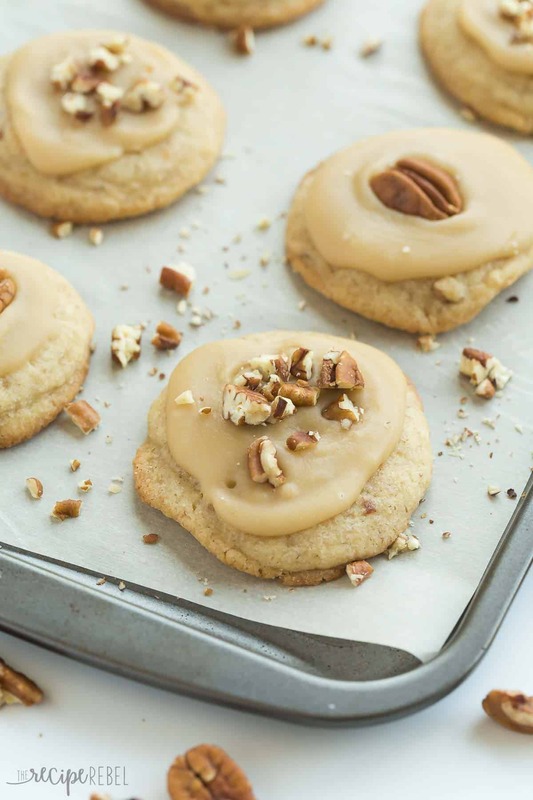 But I tried to channel my secret inner Southern girl when I made you these praline-inspired cookies. Now, when you make these, there is just the perfect amount of frosting for the cookies plus about 3 tablespoons. Feel free to spoon those right into your mouth. You don’t even have to tell anyone. This Brown Sugar Frosting is my new favorite thing. It’s so easy because the sugar and milk are melted together, and everything else can just be stirred in. But then, with 5-10 minutes it’s firmed right up so you can stack them right away. And if your frosting gets a little cool and difficult to spread, just pop it in the microwave for 10 seconds or back on the stove on low for a few minutes, and you’re good to go (I actually had to do this twice while making these). Christmas or not, you need these in your life. I don’t chill my dough before rolling and baking these, but if your butter was quite warm you might find your cookies are a little flat. If you want them to hold up better and be thicker after baking, just pop the dough in the fridge for 20-30 minutes. Since I’ve started baking my cookies on parchment paper I just can’t stop — they come off without a fuss and the clean up is nill. Plus, you can reuse and reuse and reuse parchment paper for baking! I highly recommend these parchment baking sheets. 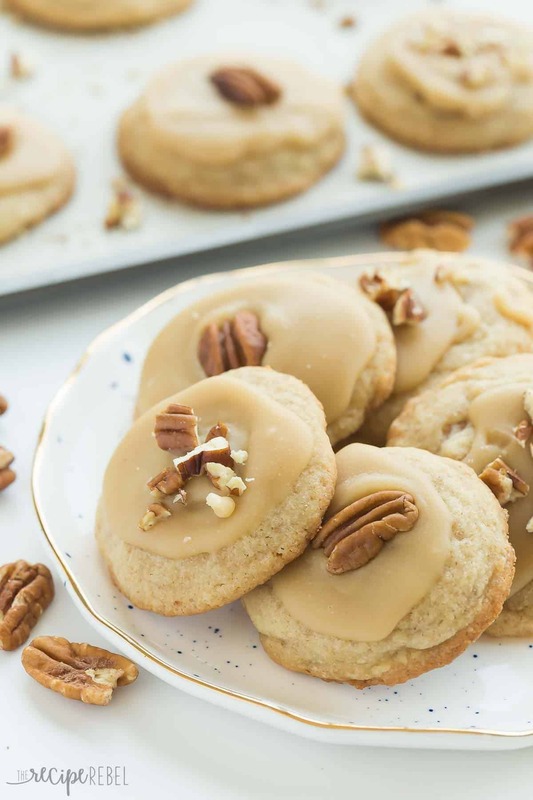 These cookies hold up well and are perfect for gift giving! I love these Christmas cookie boxes for gifting baking — and they can also be reused! 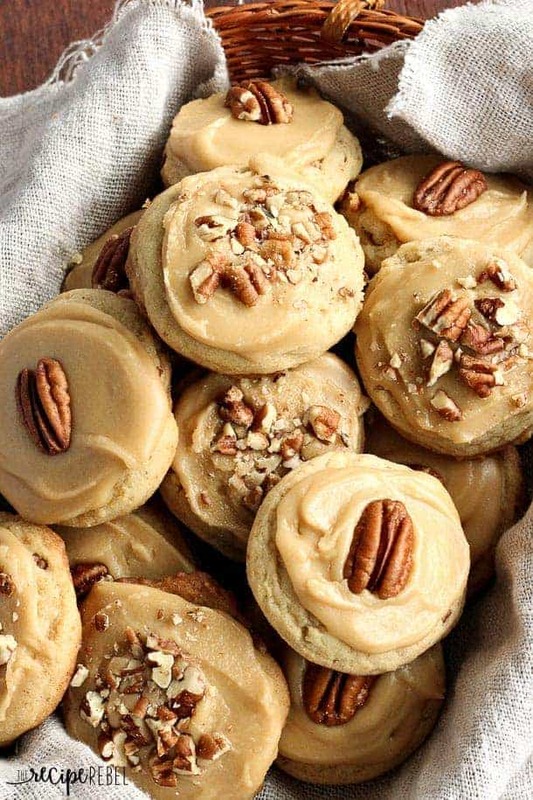 Brown Sugar Pecan Cookies: soft, moist pecan cookies topped with an easy brown sugar frosting. Perfect for Christmas or holiday baking! Cookies:In the bowl of a stand mixer, beat butter and sugars until light and fluffy. Add in egg and vanilla and beat until combined. Shape into 1" balls (I used a 1 tbsp cookie scoop) and place a couple inches apart on lightly greased cookie sheets or parchment paper. Bake 10 minutes or until set (not glossy at all in the middle) and lightly browned at the edges. Cool before frosting. FrostingCombine brown sugar and milk in a small pot over medium heat. Bring to a boil and boil 3-4 minutes, stirring constantly. Remove from heat and stir in butter. Stir in 1 1/2 cups powdered sugar and whisk or beat with a mixer until smooth. If frosting is too thin, add more sugar, but keep in mind it will firm up dramatically within a few minutes. Recipe adapted from Southern Living Christmas Cookbook. 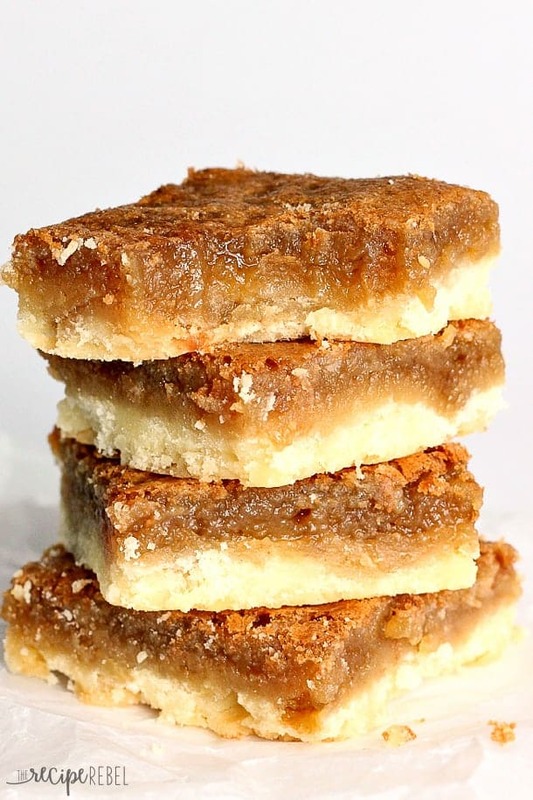 You might also like these Butter Tart Squares! I was just curious if you could substitute almond flour for AP flour. I’m trying to cut back on my carbs, but every now and then I crave something sweet. Thank you. Hi Debi! I really don’t have a lot of experience baking with almond flour. I don’t know that you’d be able to substitute it 1 for 1, but I’d love to hear how it turns out if you try it. I made these tonight and they didn’t turn out like I had hoped. after baking for only 5 minutes, they were totally burnt around the edges. Super sad cause I spent all afternoon making/looking forward to them. Really delicious cookies. A remake for sure! These are truly incredible cookies. And may I say, you were definitely channeling something southern because you nailed the taste of pralines! My family and friends thank you for posting this recipe. I’m so glad to hear you liked them! 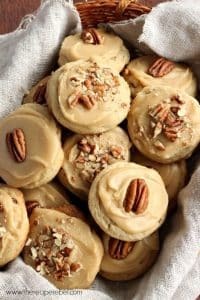 I got the recipe from Southern Living but I just had to share!